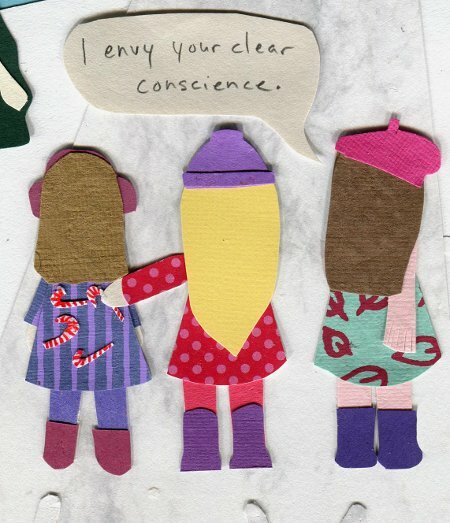 This week’s comic guest stars Kate from Spineless Wonders, who won the Movember Giveaway. I hope you enjoy reading it as much as we enjoyed brainstorming it together! And congratulations again to the other giveaway winners Pete, Jackie, and Arrie! By the way, there is FREE shipping on prints until December 9 at midnight at my society6 shop. Check it out! I just added a lot more prints! I love your posts; great, great, great, and thanks! Ahhh look at your gingerbread banner!!! What a great idea! CONGRATS to Kate for winning one of THE BEST blogging prizes of all time. Seriously. I would stick a thousand candy canes to my OWN back, and then eat them, for a Nicki masterpiece! Haha, thanks! I made gingerbread cookies with my daughter this week, and I just couldn’t resist. They were delicious, too, though I felt guilty biting my sisters’ heads off. Now that was thoroughly entertaining. Love the ginger girls too. I disagree. 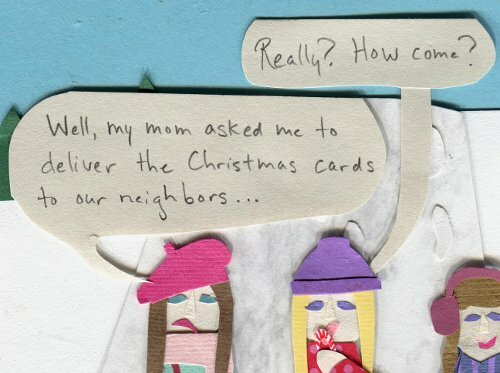 I think this story is really good, but I think what makes it funny is people’s imperfections–Kate stuffing all the Christmas cards in one mailbox, and Chrissy sticking pre-licked candy canes on Charlotte’s back, RIGHT as she’s claiming that she’s “been good all year,” so she’s sure Santa will bring her what she wants. If the Middlest Sister (along with the four other sisters on either side of her) was perfect, then it’d be boring. :) it needs to be printed out and framed! ZOMG, THE TARDIS! Soooooooooooooooooo jealous! I just squealed so loudly. Heheheheh … more fun with candy canes! Great idea and wonderful execution. LOL! This reminds me of the time one of my sisters stuck a wet candy cane in my hair. We had to cut it out. It was horrible. And the little brat still got a present from Santa, believe it or not! Oh, no! Santa should have left her just a little coal, at least! THAT story reminds me of a time in my youth, shortly after Christmas, when my brother took Peanutty Putty that he’d gotten in his Christmas stocking, and mashed it into my fuzzy polar bear blanket. My mom had to use nail polish remover and a butter knife to get it out, and it took FOREVER, and she was really mad at him……but, the following year, we got Silly Putty/Peanutty Putty in our Christmas stockings again, just like we did every year. I thought that that was strange, because this happened when I was twelve or so, and well old enough to know that Santa Claus was really my parents, so why would they willingly give us something that my brother had proven he couldn’t be trusted with? I know they could have given it just to me, but I wouldn’t have put it past him to steal my Putty and do something destructive with it. Fortunately, he’s grown up a lot since then. So cute. I’ve already had enough of the kids constantly stealing candy canes off the tree, then my daughter gets goop from it stuck in her hair while she’s eating it. Good times. Your new banner is so cute and looks so delicious! Ha! I was going to put candy canes on my tree (it’s such a sweet effect!) but my 3 year old is going through a phase where she prides herself on being “sneeeeaky,” so I knew she’s eat them all in a day and make herself sick. She’s already setting up booby traps around the tree to catch Santa. Kid can’t be trusted. Instead of real candy canes, why not do a simple craft project with your daughter, and make your own pretend candy canes out of red and white pipe cleaners? Love it! Great police box at the end, too.. 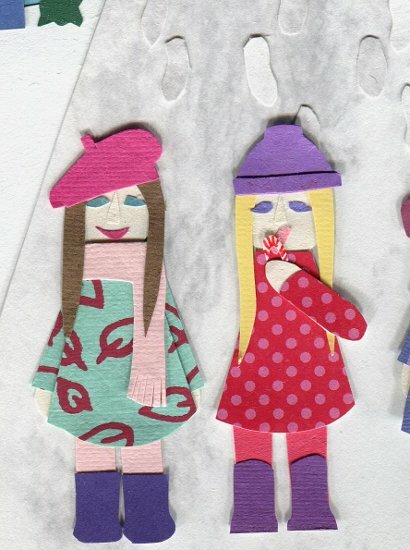 I really enjoy your blog, it brings a smile to my face each time I read it. Thank you so much for sharing. I’ve been away for far too long! Love the new look! Thanks :D It’s just temporary for December; just being silly. I’m so glad you laughed at that, because I sure did :D Kate was great to work with; she had such funny stories. I’m so, so happy that you like it! Thanks for being so easy to work with! WOW! It’s time. 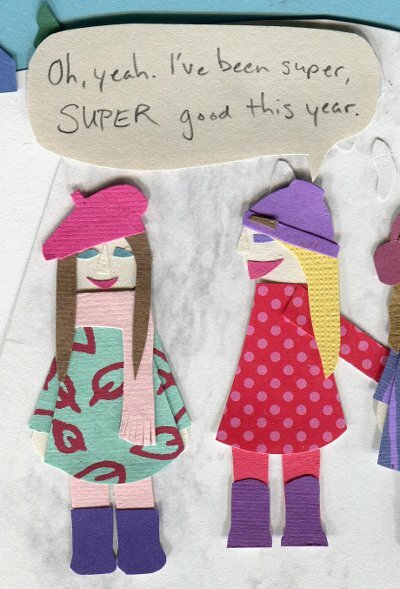 I am guest starring in Nicole aka The Middlest Sister’s web comic this week! It’s amazing. 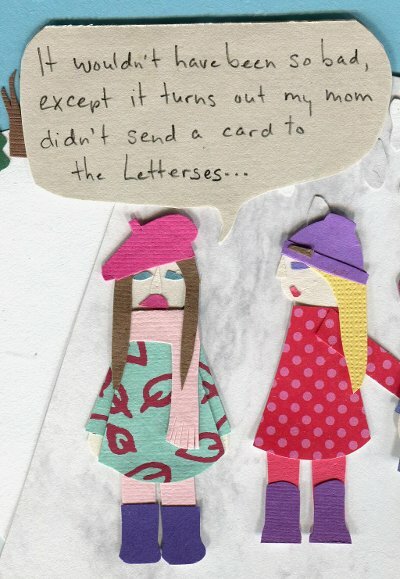 The story is all based around true events from my childhood she even perfected the cerise coloured beret which is just like the one I had as a child. This is the most amazing prize! WOW! Thank you so so much Nicole. Guys, if you’re not already following this blog you should be! Nicole, this is the first I’ve seen your work, and it is awesome! 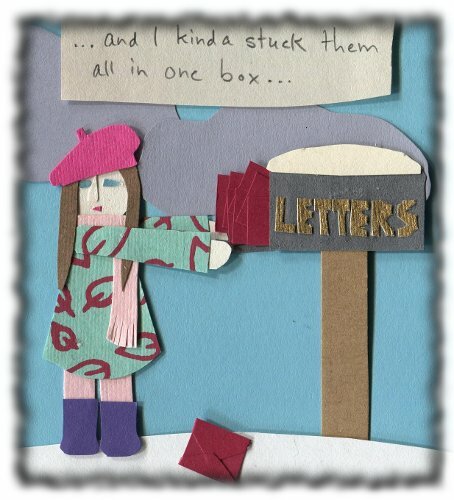 … Kate, you naughty girl putting all those cards in one box. But you look mahvelous doing it!! So cool you won this contest! Well, in truth it was just the one card that I posted in the wrong box, but in my head I did for the right reasons… lol. But this way it makes a better story, Maddie. Seeing this really tickled my big brother! :) Isn’t it just awesomeness? Sorry, Nicole, I’m commandeering your blog post! this blog is one of its kind….Love your blog!! Thank you and thanks for subscribing! What ever happened to the spirit of the holidays? Don’t know, but loved the post! Did this ever really happen? I mean, not the part with Kate, but did Chrissy ever actually stick pre-licked candy on people’s backs? I just stumbled upon your blog and I immediately fell in love with it! I love your humour and scissor-skills. Hahaha Mr(s?) 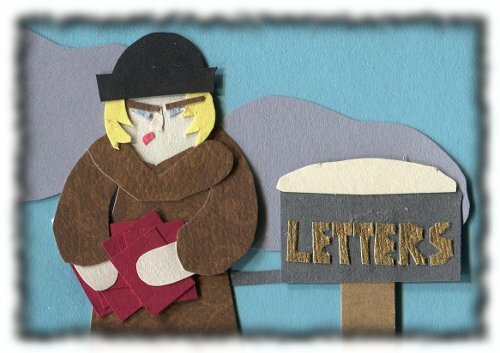 Letters looks like a blonde Friar Tuck! Hahaha! I guess she does! She actually reminded me more of a blonde version of Miss Viola Swamp. You have such a charming blog here. You are mightily talented. I also have 4 sisters, but I am #2! We also have one brother…he is the baby! You are amazing!!! Such a unique artist!! I JUST LOVE these comics and the entire concept. It’s simple yet excellent humor, it’s highly creative, very expressive, and just all over brilliant! I’m definatly folllowing/liking, and I definatly look forward to more of these post; thanks and keep them coming! 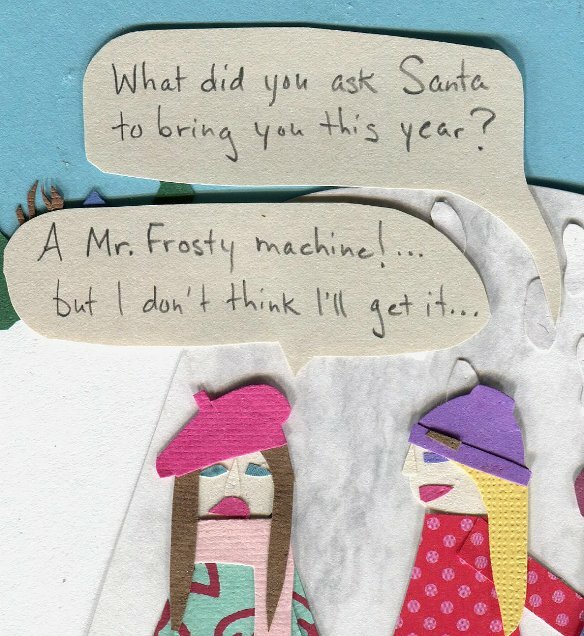 Also, did Kate ever get her Mr. Frosty machine?